Open Accounts: U.S. & Canadian customers: Webber Electronics will establish an open account with a nominal credit limit for every new customer, after they provide one U.S. bank and three U.S. trade references. Other payment options include prepaid and wire transfer. If requested, orders can also be shipped utilizing a credit card until sufficient credit is established. Individuals must pay by credit card, or cashiers check. International customers: Please note that terms on international orders are prepaid in U.S. dollars, credit card, bank wire transfers, and bank checks. Terms of Payment: Our terms of payment on open accounts will be established per account. Shipments of future orders will be affected by the past due condition of an account. Minimum Orders: We do not have a minimum order on in-stock items. Taxes: Any applicable federal, state, or local taxes will be added. Advance Payments: Please include all shipping charges, wire transfer fees, insurance charges and applicable sales taxes in your payment. We reserve the right to delay shipment on orders accompanied by personal checks until the checks have cleared. Special Packaging: When requested, at the time of order entry, we can package materials in non-standard configurations. An additional service charge may be assessed for materials and labor in these cases. Prices: All quoted prices are net and F.O.B. Ohio, unless otherwise stated. Prices are subject to change without notice. Return Policy: When authorized by Webber Electronics' Customer Service Department, goods may be returned for the convenience of the customer. However, a restocking charge may be assessed. Our Receiving Department has been instructed to accept packages from customers only when our RMA (Return Material Authorization) number is clearly visible on the shipping label. Please contact our Customer Service Department to request an RMA number. Product Liability: Webber Electronics will accept liability for only the purchase prices of products and applicable freight charges. 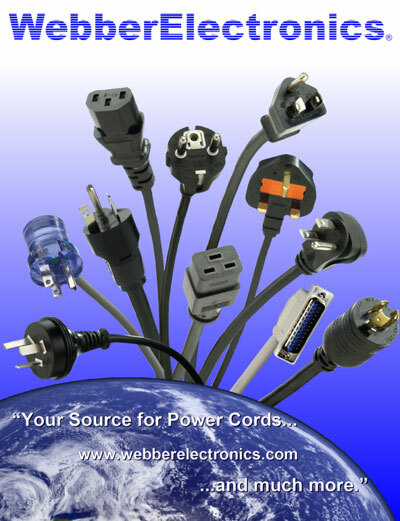 Webber Electronics is not liable for any costs for issues such as production delays, rework, late deliveries, etc. unless agreed upon in writing by both Webber Electronics and the purchaser. Product Specifications: All specifications listed in our catalog, on the web site or on other data sheets are based on our knowledge and understanding of the products as of the time print or post. We reserve the right to make changes to technical specifications without notice. All product recommendations are based on our knowledge and experience with the products, but do not eliminate customer responsibility to check the suitability of our products for each particular application. Free evaluation samples are available upon request.